There is no question as to the limitations of smartphones when it comes to screen size. For most of the handsets that are available in the market today, the screen size range of between 3” to 5” may pose some challenge when it comes to ease of typing and using apps designed specifically for large screens. For consumers that need bigger screen, the phablet, which is a cross between the usual smartphone and the larger-screened tablet, was invented. There are a number of phablets existing in the market today, the quality of which range from the low-spec to the high-end ones. With the array of choices for you to consider, you are treated with devices that can solve your business’ specific communication problems. 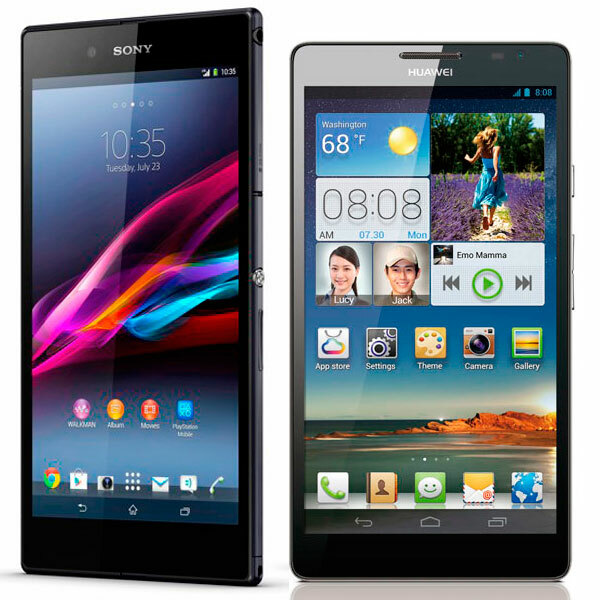 Two fresh devices currently in the market are the Xperia Z Ultra from Japanese firm Sony and the Ascend Mate from Chinese company Huawei. These devices are excellent in their own right, and if you want to know more about them, the read the separate short previews below. The Sony Xperia Z Ultra is an LTE-capable phablet that is the biggest handset released by the Japanese firm so far—it has a massive 6.44” screen. It is also a powerful addition to the Xperia line of smartphones, housing an impressive top-of-the-line Qualcomm Snapdragon 800 chip inside its body. Despite its bulk and heft, the Xperia Z Ultra manages to look stylish with its metallic frame combined with tempered glass on the front and rear of the device. It features a minimalistic design that complements its light weight—a mere 212g for a phone of its size. Meanwhile, if you are looking for a phablet that offers you vibrant and rich colors despite that relatively larger size of its screen then the Sony Xperia Z Ultra is fits your requirements. It has Full HD Triluminos display, which has resolved the color shift problems related to the Sony Xperia Z. Another amazing thing with this device is that you can actually take underwater photos and footages with it thanks to its waterproof features, having an IP58 durability rating. It is also dustproof, like most of Sony-manufactured devices. In addition, it sports an 8MP camera (lower than the 13MP shooter of the Xperia Z) which can take pictures better during low-light conditions. Aside from this, the Sony Xperia Z Ultra comes with a pen-style input device with built-in handwriting recognition tools. This device runs on Android 4.2 Jelly Bean operating system with a custom Sony user interface that retains most of the stock Android features. It comes with a 2.2GHz Qualcomm Snapdragon 800 quad-core processor that is coupled with 2GB of RAM. Do not get your hopes high: this phablet from the Chinese company is not something that you would want to write home about. Yet it is a respectable device, as far as smartphones go, with its linebacker built and custom software interface. The Huawei Ascend Mate is one of the largest smartphones you can buy today, sporting a 6.1” screen, though it has a lower-resolution compared with what you’d expect from a device of its size. Design-wise, this phablet is a monster of a device, measuring 6.4 x 3.4 x 0.4” and weighs 7 ounces. It is not a light device, if that’s what you’re asking. It sports a 6.1” Super IPS LCD screen that packs a resolution of 1280 x 720p, giving it a pixel density of 241ppi, which is paltry when measured against current standards. Meanwhile, this smartphone has a middling performance, with its 1.5GHz quad-core Intel XMM6260 processor registering mid-range rating on various performance tests. In addition, this phone features an 8MP rear-facing shooter and a 1.3MP front-facing camera.